Is there anything you can do when the Gartner Magic Quadrant (MQ) or Forrester Wave just doesn’t seem to fit what you do? 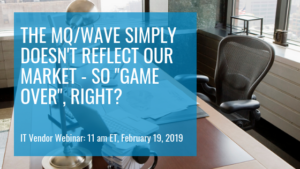 Over two-thirds of companies, who are in MQ and Waves, do not see assessment definitions as being a match to where their business fits into the market! You are not alone. Join us for our next webinar on Feb 19 at 11am ET (4pm UK) and find out how you can change the outcome of analyst engagement for your company.